Ledger’s Hideaway was named after a handsome young man whose big dreams will barely fit within the walls of this cabin! Built in 2001, Ledger’s Hideaway is wonderful for snuggling, relaxing & day-dreaming. It’s perfect for a couple looking to get away from it all. The charm of this small cabin is inviting especially with a front deck as big as the cabin! Ledger’s Hideaway is a part of the Last Resort Campground. The courtyard area of the Last Resort Campground features a large circle driveway with an incredible rock fire pit area. The Last Resort is one of the family friendliest & pet friendliest camp grounds in Broken Bow. 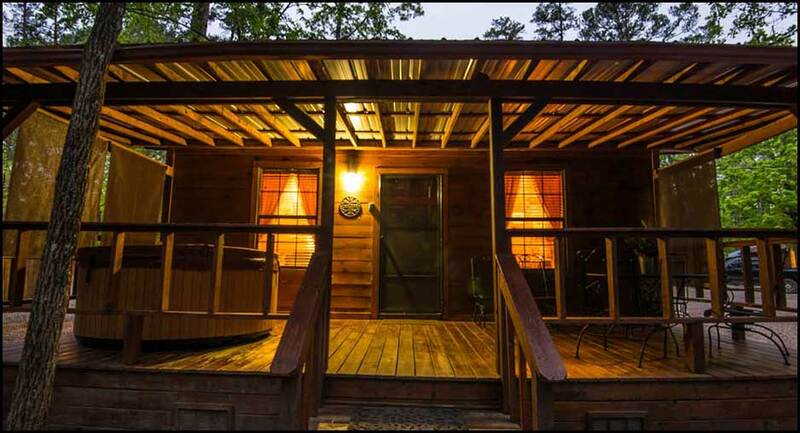 Eight cabins set amidst the lushness of the hardwood forest, this relaxing Broken Bow getaway greets you with a casual invitation to come and enjoy. We provide the firewood for the group area and outdoor lighting. You just bring the marshmallows! Ledger's Hideaway is a one story, one bedroom cabin. The sofa in the living room is not a sleeper sofa. Ledger's Hideaway is a perfect little gem of a cabin featuring a front porch with hot tub, charcoal grill, and private fire ring. The living room offers a TV with cable access and DVD player. Ledger’s Hideaway is located in an area with other cabins, known as Last Resort Campground. It is located on Golf Course Road which is north of the lake (Please click to view map) There are other cabins in this area. Each one offers limited privacy. This cabin is not secluded but there are several trees in this area. The road to Ledger’s Hideaway is black-top. The driveway changes to gravel. There are only about 75 yards of a gravel road. It is motorcycle friendly.